I am not buying into any of this back and forth battle between the NFL and the Orioles, pertaining to the scheduling conflict to occur on September 5th. Traditionally the Super Bowl champions open up the following season on Thursday night at home. As a matter of fact, I believe the last time the Ravens won the Super Bowl they didn’t get the prime time honors either. They opened against the Chicago Bears in the routine 1:00 on Sunday time slot. For whatever reason, it looks like that it has already been decided that the Orioles and Ravens can’t possibly co-exist at the same time here in Baltimore. The NFL is flexing their multi-billion dollar industry muscles towards MLB and the Orioles, saying that they want to give the Ravens that honorary home game as Super Bowl champions. The Orioles and MLB are the little guy in comparison and don’t want to be bullied around. So they are standing their ground and convinced that the 7:05 start time against the Chicago White Sox means the world to them. Absolutely no way on earth they can change to an earlier start time to accommodate the Ravens. You expect the Orioles to get on a plane in Cleveland at midnight to get back into Baltimore and in bed by 2 a.m. and then report to the park on only six or seven hours sleep at 9 a.m. to prepare for a game a 1 p.m.? What do you think they are? Highly paid professional athletes? What if there is a rain delay in Cleveland and they don’t finish the game until midnight, don’t get back to Baltimore until 4 a.m.? Then the next days starter has a bad game and the Orioles miss the playoffs by one game. Everyone will point to that loss as “the one”. Not any of the other losses. It would be the Ravens fault, and we can’t have that. Take Thursday off and schedule a double header on Friday? Are you crazy? Who plays two baseball games in one day? We can’t ask our guys to do that. Mind you that the team you’re playing also would have to adapt to the situation, so in no way shape or form does it give the Chicago White Sox any advantage over the Orioles. Except that they travel from New York to Baltimore, whereas the O’s are coming from Cleveland. It’s not like the O’s are coming from Seattle. I hope you can detect the sarcasm in those last couple paragraphs. I don’t buy any of the excuses. The NFL can’t be a league that plays on Thanksgiving, Christmas, New Years, and decide they can’t play on Rosh Hashanah. I don’t know all the rules, but if Rosh Hashanah fell on a Sunday, would they not have games at all that weekend? I’m pretty sure the NFL plays games during the eight days of Hanukah. This excuse by the NFL is a joke. I reiterate that again, using the Jewish holiday as an excuse not to move a football game is laughable. Not the holiday itself. Want to be clear to not ruffle any feathers there. Groups on both sides of the argument have had no problems with rescheduling games before. The NFL had no problem moving the opening game this past year to Wednesday to accommodate the Democratic National Convention. The Orioles a couple years ago moved a game from 7:05 to 1:05 in an effort to let fans leave the city earlier so that final touches to the incoming Baltimore Grand Prix could be done. So the Orioles have a major issue with accommodating the Super Bowl champs, but bend over backwards for a car race that no one cares about? Yeah it was cool, once. The Grand Prix is more headache than it’s worth for people who travel about the city. I digress. Maybe the big bully Roger Goodell should have asked the Orioles or MLB nicely. Do the Orioles have to move their game to an earlier time, or another day? No, they don’t at all. They are entitled to that time slot already scheduled. Can the Ravens still host a game that same night right next door? Yes. Why not? What if it was a situation where the schedule was already in place? Say for instance the Orioles make the playoffs and the designated time slot for a game for the team in that slot was Sunday afternoon while the Ravens we’re already scheduled to play at home that afternoon. Or if both we’re to play on a Monday night. So just schedule the damn thing! Work out the details later. If the Orioles are in a pennant race, they will have no problem filling that park at the same time the Ravens return to action. There are plenty of Orioles fans who are Redskins fans that couldn’t care less that the Ravens are playing a block away. If the Orioles are in last place then no one cares about moving the game up six hours because no one is showing up to it anyway. If parking is at a premium and mass transit gets a little crowded, is it the end of the world? No. 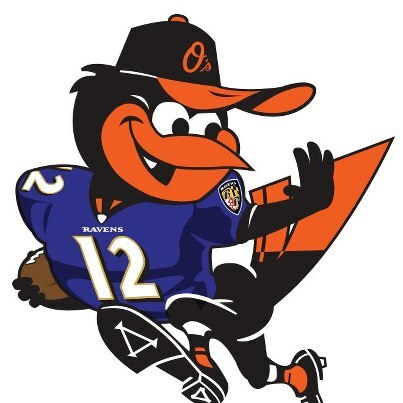 I think the notion of the Ravens and Orioles playing simultaneously would be a logistical nightmare is getting blown way out of proportion. It can’t be that hard to wrap your head around, with the exception that I’m pretty sure most ushers and food service employees work at both Oriole Park and M & T. So you create extras jobs for one night. That’s a good thing, right? The city closed streets to accommodate 200,000 people for a ticker tape parade. They make the city hell to get around in when that stupid Grand Prix comes to town for a whole three days. You’re telling me that the Orioles and Ravens can’t co-exist for just one night? I don’t buy it. I went out to St. Louis two years ago when the Ravens played the Rams out there. It was week 3, so baseball was still going on. On the schedule at the same time as the Ravens vs. Rams were the Cardinals hosting the Cubs a couple blocks away. Anyone who has been to St. Louis knows that the stadium set ups are somewhat similar to what we have in Baltimore. Both downtown, close proximity to each other, with very little parking lot space, leaving a lot up to public parking and mass transit. I listened to some talk radio and local news during my time out there, and never once did anyone call and complain or care to even bring up the fact that they were scheduled to play at the same time. No greedy billionaire owners crying over maybe losing a few dollars. That right there tells me it can be done without any bloodshed, and without anyone crying over the potential for a few less dollars coming through the turnstiles. Or it tells you that it has happened before and neither side lost any money. If they did lose money, you would have heard about it.